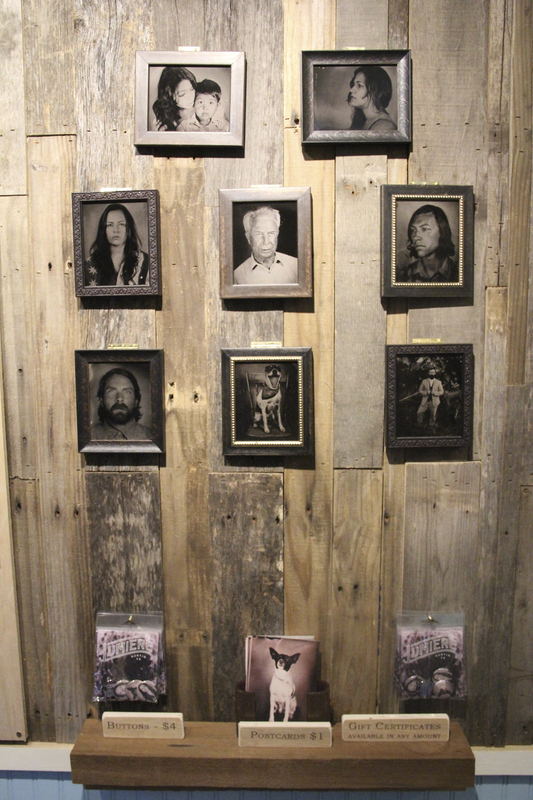 Austin couple Adrian Whipp and Loren Doyen own Lumiere Tintype, a photography studio that developes photographs with the same techniques used during the Civil War. On any given sweaty Austin afternoon, UK native Adrian Whipp could be trudging across a field to find the “perfect” tree, equipment in tow. His haul? 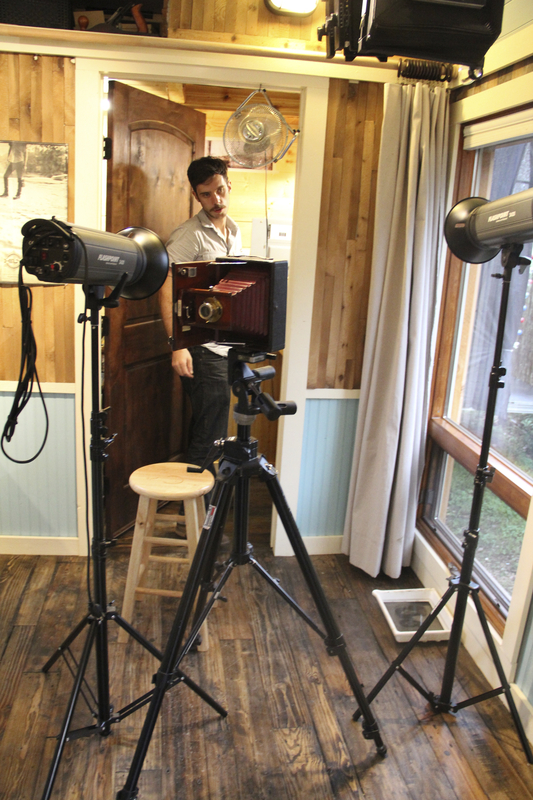 An 8 X 10 camera, weighing in at almost 45 pounds with a tripod. Behind him, Whipp’s truck is full of chemicals and bottles — “all this insane stuff” — to produce photographs using mid-19th century techniques. “It’s times like that you question what you’re doing,” Whipp says, glancing down at his sulfur nitrate-stained hands. But five months in, Whipp and his wife Loren Doyen’s company, Lumiere Tintype, is thriving. It started out as a side project. Whipp and Doyen had been “playing with the process” of tintype for a few years, which is no small feat. The process, from shoot to varnish to dry print, takes an average of 35 minutes per photo, not including the set up before and clean up afterward. Whipp quit his day job to start Lumiere. 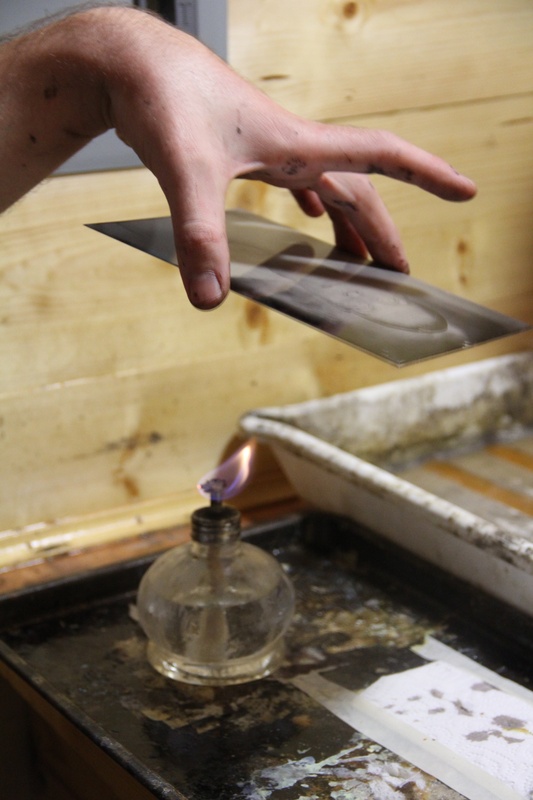 Whipp, who has a visual communications degree from Leeds University in Westshire, England, says the idea of a tintype company stemmed from “wanting to get back in the darkroom,” despite the decline of film use. “You know it’s got an indeterminate future. You don’t know if film’s still going to be around in fifteen to twenty years. We make our own film so you know it’s not going anywhere,” Whipp explains. The couple initially ran the business from their own home, but quickly realized they needed a mobile darkroom, so they decided to build a studio on wheels. “We started with a flatbed and then we built it like a house.It was a lot of fun, actually,” Whipp says. These days, the trailer and the couple behind Lumiere spend their evenings at Justine’s Brasserie, a French establishment on Austin’s east side. 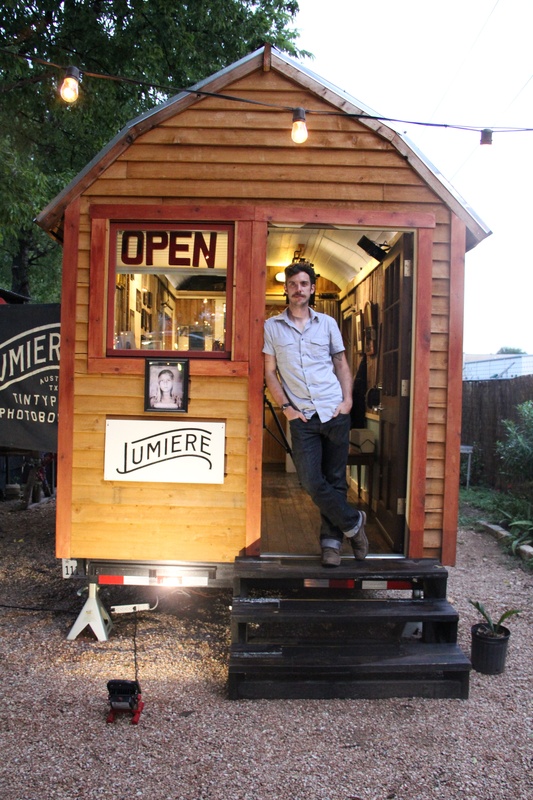 From 6 p.m. to 2 a.m., Lumiere sets up shop in Justine’s courtyard. Whipp shoots the photographs, and, when she’s not at her day job as a paralegal, Doyen works the darkroom. Restaurant patrons can have their photograph taken during the table wait, and the photo will be developed by the time they are finished eating. In addition to working nights at Justine’s, Lumiere also photographs special events. Most recently, Whipp and Doyen coordinated a photoshoot with Revival Cycles for Tribeza Style Week. Whipp says the most rewarding part of his job is meeting people who, like the folks at Revival, work in a creative realm. “I’m seeing a theme. Everybody we’ve partnered with so far does things in a way that complements our style. So it’s handmade; it’s a slower way of doing things," Whipp adds. J.J. Abrams’ use of lens flare in the movie Super 8, which mirrors Lumiere's style, inspired Whipp to dream up the company's slogan: “Light through glass, forged in dreams.” “The lens flare is really an artifact that reminds you that what you’re watching is a film. It resonated with what we do, in terms of, things are gonna go wrong, but that’s okay. Because it’s just telling you that you’re looking at a simple camera. It’s just glass and film. There’s nothing else involved. Some of our cameras don’t have shutters or apertures or anything. It’s just glass," Whipp says. As for the future of Lumiere Tintype, Whipp is cautious but hopeful. “You can never tell because there’s no security to it at all. It could just dry up tomorrow or something catastrophic could happen, but I still feel like it’s a worthy pursuit. I’m having way more fun doing it, so that’s a good thing. I just wake up in the morning, like, ‘this is what I’m gonna work on today’ or ‘this is something that interests me, so I’m gonna follow this.’ That’s really inspiring,” Whipp says.